If you don’t stand out in the crowd, you won’t get noticed. You’ll be just like everyone else: drifting through life (or struggling in your network marketing business). Most distributors in our industry have that problem! They struggle because they follow the pack, rather than create their own trail. For some weird reason, we are all taught to follow the same system, do the same thing as our upline, and be robots. We’re all told to build our business exactly like everyone else does. We’re told to do these things, but never told why. Even worse, we’ve never been given another option to choose from. Our industry really is the blind leading the blind (for the most part). Do you honestly believe that just doing what everyone else in your upline/company is doing is going to make you successful? It could, but there’s a good chance it won’t work for you, even if it worked for them. In fact, the odds are stacked against you. Do you really believe there is only ONE WAY to build a successful network marketing business, and that way just happens to be your upline’s way? The failure rate within our industry, and the failure rate within most SYSTEMS in our industry is pretty high. I’m not knocking the industry, or any of the systems, but I learned a long time ago that there is more than one way to skin a cat (sorry cats)! As I see it, successful people, and successful network marketers, do things differently from everyone else. They don’t follow the crowd. They don’t follow trends. They set trends. They create their own crowd. They blaze their own path. Successful distributors leverage their own talents and abilities to build their network marketing business in a way that works for them. They might take some advice from their sponsor or upline, but for the most part, they do their own thing. That’s WHY THEY ARE LEADERS! If you aren’t a leader yet, don’t fret. You can get started by following someone else’s system. Invest a few months to learn everything you can about the business, company, products and system. Develop your skills and mindset. But, listen to your gut! Trust your instincts. If the way you are learning to do the business doesn’t make sense to you or resonate with you, don’t block out your gut feeling. Be willing to experiment and try new things. Keep an open mind. Seek advice from several trusted mentors, but ALWAYS listen to your gut feeling. Your intuition is seldom wrong. If you can’t answer those two basic questions, your prospects won’t be able to either. If you can’t answer those two questions you won’t be in business long. Until you do that, it’s going to be hard to get people to listen to you and want to do business with you. Until you know WHAT separates you from everyone else you will be just like everyone else: STRUGGLING. Trust me, there is something UNIQUE about you. There is something special that makes you different from everyone else. In fact, we are all different. The only real mistake we make is trying to be like everyone else. The bottom line is this: being different in network marketing is a good thing. The only thing you want to duplicate in this business is the RESULTS. However, keep in mind, there are THOUSANDS of different ways to get those results. 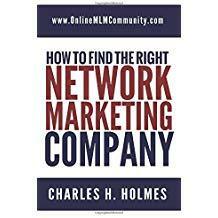 Can Everyone Succeed in MLM? He taught me that you could look at 100 successful reps in our industry and ALL of them build their business differently from each other, even if they were all in the same company. Trying to put a round peg in a square hole is a recipe for disaster. You must figure out a way that works for you and focus on that, rather than try to build the business the same way everyone else does. Why? Because everyone is different. We are all wired differently. What works for one person will rarely work for someone else. What makes you different is your Unique Selling Proposition. McDonald’s is fast and cheap. Domino’s Pizza is 30-minutes or less. Walmart is cheapest prices. Those are just a few examples of Unique Selling Propositions in action. I chose to be the No B.S. Network Marketer. I like to call a spade a spade, avoid hype and fluff and be direct and to the point. I also focus on building a business online and teach people to do the same thing. People who respect those qualities like to do business with me. People who love hype don’t like me. My USP attracts the person I want to attract and repels the type of person I want to avoid. You must come up with the same thing in your network marketing business. Identify WHY people should do business with you by being different in network marketing and having a crystal clear USP. I cannot tell you what to choose, because I don’t know you. Whatever you do, don’t try to be someone you’re not. Figure out what makes you unique and focus on that. What do you think about being different in network marketing? Spend some time and write down a bunch of ideas about what you could do differently to be successful in your business. Identify your natural talents and abilities and focus on that. Do you believe in doing what everyone else does or doing your own thing? Leave a comment below to share your thoughts. I look forward to hearing from you.